The MarcoPolo-M5 is an ambitious sample return mission to the D-type Near Earth Asteroid 1993 HA that has been proposed to the ESA Cosmic Vision M5 launch opportunity. D-type asteroids are the most abundant asteroids beyond the Main Belt, and current models of solar system formation indicate that they may have formed out towards the Kuiper Belt. Their very dark surfaces and spectra indicate that they are particularly organic and volatile-rich and contain abundant anhydrous silicates. Therefore, D-type asteroids may be intermediate between primitive asteroids that populate the Main Asteroid Belt and comets and are generally considered the most primitive rocky bodies available in the solar system. 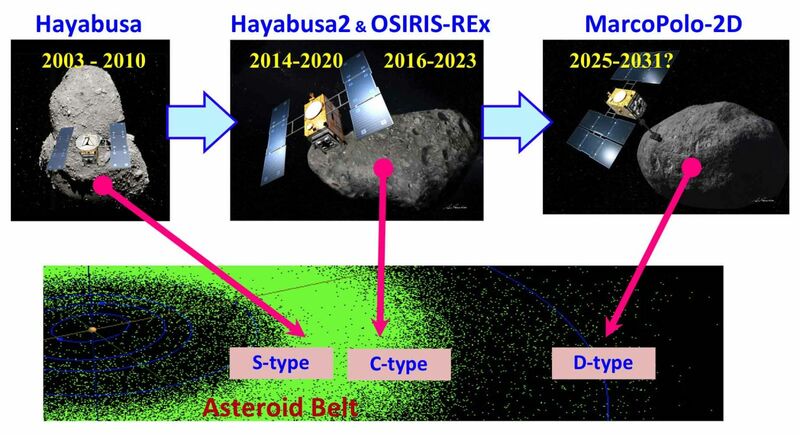 Although originating from the outer parts of the solar system, orbital perturbations provide a continuous input of D-types into the Near Earth Asteroid population, where they can be more readily accessed by spacecraft. MarcoPolo-M5 will be the first mission to return pristine material originating from the outer regions of the protoplanetary disk. Return of pristine material from a D-type asteroid will allow us to explore processes occurring at the very birth of the solar system, as it will contain a wealth of the earliest formed grains. The abundant organic compounds present offer the best opportunity to explore the origin of potentially a key ingredient to the origin of Life on Earth, delivered shortly after our planet formed by primitive asteroids and comets. The isotopic signature of the water and other volatiles that are present in D-type asteroids can also be investigated with the returned sample, in order to explore a major, but as yet poorly understood, possible source of the Earth's oceans. The mission also provides the opportunity to investigate the surface and interior of such primitive bodies, through high resolution imaging and a deployed lander, providing valuable ground truth and understanding for remote observation for a whole class of objects in the solar system. MarcoPolo-2D is proposed for launch in January 2029, when 1993 HA offers an exceptionally short transfer, arriving at the asteroid in November 2030 where it then has almost 8 months of science operations and sample collection before returning to Earth in September 2032, a total mission duration of just over three and a half years. This will generate an e-mail to Ian Franchi, who will add you to the list of supporters and mailing list.